It has been our experience that many hotels and commercial entities have invested in the leading technologies available but have failed to upgrade their structured cabling plant. This may inhibit the maximum performance of the technology investment. It is in the best interest of your investment to consider upgrading your existing cabling to enhance the performance of your network capabilities. We will perform site surveys based on the equipment being proposed to provide a professional structured cabling installation. We have the design expertise necessary to develop your network. We connect your business to technology! Slides showing some of our hotel clients. Cabling Solutions, LLC is a telecommunication company. We provide state of the art structured design and implementation services for wired and wireless networks. We offer cabling for voice, digital subscriber line (DSL), high speed interent, or television. We utilize fiber optic cable, coaxial cable/CCTV, and ethernet cable including all types, cat5 up to and including cat7. Cabling Solutions, LLC provides nationwide installation, service and maintenance for hospitality, commercial, retail and government applications. 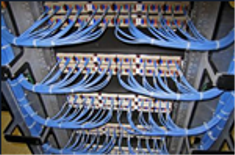 Cabling Solutions, LLC is an industry leader in the field of structured wiring design. Cabling Solutions, LLC is an industry leader in structured cabling designs that meet or exceed all industry standards nationwide! We are a WBE (Woman Business Enterprise) company that has been in business for 10 years with a proven reputation for excellent service and installation. We are licensed, insured and bonded throughout the nation including state and local municipalities. We provide personal service and recognize the importance of each and every project. We provide customer support 24/7 365 days a year. Please see our Contact Us page for more information.